12SP Entertainment is a new publishing company, founded by Anthony Gallela and Jeff Wilcox, currently seeking support for their first published design on Kickstarter – the airship racing game Zeppeldrome. With extensive backgrounds in the hobby, both professionally and personally, Anthony and Jeff have a passion to focus on the aspects that make games fun. We here at iSlaytheDragon appreciate Anthony taking the time from what must be a whirlwind schedule with his first crowd-funding campaign to sit down for a few questions. Anthony, no doubt, an accomplished airship pilot must be confidently, perhaps arrogantly, to the point about most matters. In that vein, describe Zeppeldrome in one sentence. 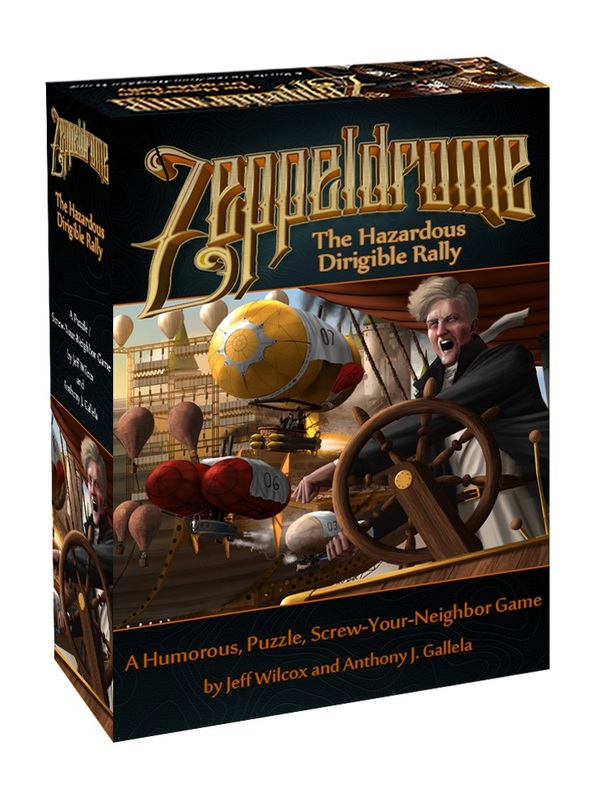 As the publishers – Zeppeldrome is a humorous, puzzle, screw-your-neighbor game with the theme of a dirigible race. The board has a hazardous obstacle course that players need to navigate their airships through and around. This course is modular, so players can change which hazards they are playing with each game. Players have a hand of cards, each of which will either be used to show the path they are attempting for the turn, or for the actions on the card that will either help them, hinder their opponents, or both. What particularly about the mechanics and theme attracted you as choices for this, your inaugural design? Jeff and I have each designed a number of games before. We chose this one to be our debut game for our new company, 12SP Entertainment, in part because it was a game we love that we designed together, in part because we’re excited about the game play, and in part because of the theme. 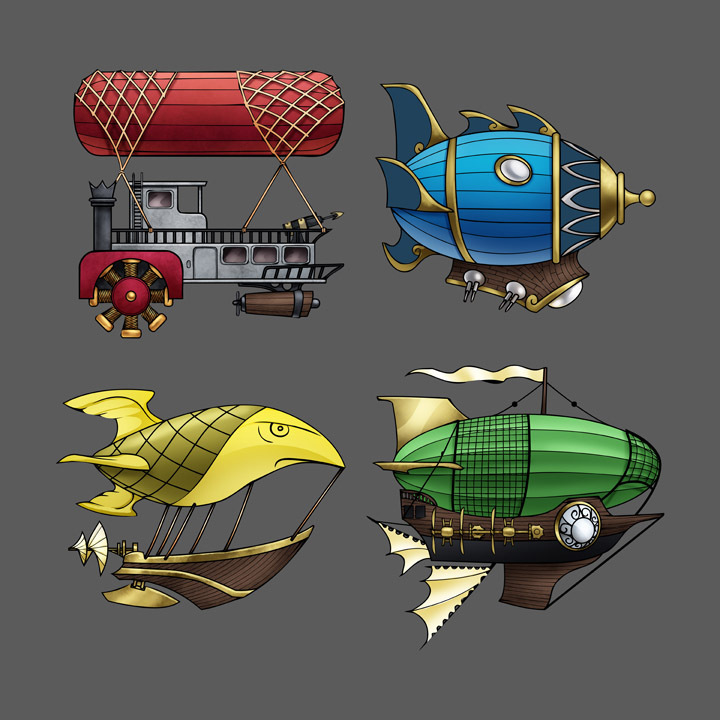 As for the theme – it was always a dirigible racing game. We thought it was funny, and so we expanded on it through the humor of (and flavor text on) the actions. As for game-play, we love that we’ve been able to design a game that allows for the fun of hassling your friends as you jockey for position in the race, while at the same time, giving the player the sense that they do have a good deal of control over their airship and the strategies they will use to win. Is there a particular target audience Zeppeldrome is designed for? Or which gamer types do you feel it will appeal to most? This type of player is legion in our hobby. And a really solid game that is ripe for expansions, like “Zeppeldrome,” gives those gamers something that they can enthusiastically get into. “Zeppeldrome” has a cool theme, it will have great art, good production values, and be at a price-point that consumers will think is fair ($35 MSRP if we just have tokens in the game, $39 if we have 3D bits). Can you give us just a little insight on the project’s development from first prototype to the current version? Did you have to scrap any original mechanics or elements? Or maybe add a significant component not originally planned? The original idea was to have a racing game where players moved both their ships and the board elements. The elements added/subtracted functional abilities of the players. It quickly became a game of airships – which was not the direction we wanted to head. The first moving board element we tried was clouds (when an airship was in a cloud, there were movement restrictions). And the game was played as if looking from directly overhead. All in all, this overhead view and the moving board elements were mostly discarded at the middle point of the design process. The accounting was distracting from the game, and the game just didn’t feel right. The idea of hazards and some control of board elements was on the right track, however. So the next iteration was the side-view race set-up. There were obstacles, movement, and actions, just like now. Each part was more complex than the current version, however. It was still too much. Then someplace along the way two things happened at once. The board became modular, so each game could have very different obstacles if players wanted. And the cards (both the flight plan portions and the action portions) got whittled down to how we really wanted the game to play: the game was one of gentle prodding of captains out of position while trying to progress through the board elements. Each turn everyone should have progress on the board – there should never be the frustration of “lost turns.” And the “screw-your-neighbor” aspect is more like minimizing the effectiveness of a turn’s plan, rather then “send the burning wreckage of my opponent back to the beginning.” We also pulled a number of things together, making the game much simpler and focused on the fun of the game (such as putting movement and actions on the same card). The last, biggest thing we changed was how we talked about the game. We initially spoke of Zeppeldrome as a racing game, and a fun filler game at that. This meant our goal was to get the game to end in 30-40 minutes, tops. But it never did. We adjusted and adjusted things and it never did any good. Zeppeldrome was a 1 to 1 ½ hour game. And then in a flash I figured it out: Zeppeldrome was a puzzle/screw-your-neighbor game in the guise of a racing game. Every play-test group since that change has felt the game’s playtime and gaming experience match expectations. It was a subtle change, but one that made all the difference. The Kickstarter campaign gives some background on your and Jeff’s careers in the industry. What from those experiences do you feel has helped shape Zeppeldrome? Both of us have designed games to completion before, and that experience certainly helped; but the most critical part of our experience that helped shape Zeppeldrome was that as game testers. We have play-tested and developed other people’s games over the course of decades. We have heard feedback given and received feedback ourselves. We have seen great games and seen less successful endeavors. All of which allowed us to take the feedback from the multitude of play-test sessions for Zeppeldrome and turn it into direct improvements. How about anything that may have initially hindered the process or raised a flag on something that you consciously worked to avoid? The main thing we wanted to avoid was a design that created bad gaming situations. Often, a “screw-your-neighbor” game will have those. Moments where a leader is pummeled into not winning. Or, in a single turn one player is set back 2-4 turns behind everyone else. We spent a lot of time adjusting what actions were available and how they are used and how game flow works to minimize these negative player experiences. Yes, you can get “got” by the other players, but it is almost never devastating, just usually humorously annoying for that one turn. And then everyone is off and running again for the next. I know Zeppeldrome is yet to be funded, but any aeronaut worth his salt should exude confidence. So any hints about ideas for future designs or is there anything else in its nascent stages? We have two sets of eight boards each that will hopefully come out as expansions (making 16 more boards people can swap in to their games), and two sets of card expansions that each add new mechanics to the game (that, again, will hopefully come out as expansions). Outside of your own creations, what kind of games regularly hit the table with the folks at 12SP Entertainment? We really enjoy a variety of games; we’re “omni-gamers.” We like all kinds of board games – from party games, to Ameritrash, to Euros, to war games; and we play minis, RPGs, LARPs, and CCGs, as well. That said, the two things that hit the table the most are other people’s prototypes and poker. Thanks for your time, Anthony. We appreciate you giving us a few moments away from your hectic Kickstarter preparations. But one final, and most important question: let’s say that you have a group of airship pilots looking to relax, unwind, and forget about their aeronautical exploits for an hour, or so. Which game do you recommend they play and why?